Cook the bacon in a pan and set aside retaining a tablespoon of the grease. Add the asparagus to the pan and saute until just tender, about 3-5 minutes. Add the garlic and green onions and saute until fragrant, about a minute. Add the spinach and cook it until it wilts. Roll out the dough and fit it into a 9 inch spring form pan. Mix the eggs, milk, cheese, vegetables, bacon, salt and pepper and pour it into the spring form pan. Bake in a preheated 375F/190C oven until golden brown and set in the center, about 25-45 minutes. I am SO making this quiche this weekend! Thanks for the recipe! A delicious late Spring brunch meal. Awesome. Great father's day menu idea!! !Looks great!!! All my favorite things in one great quiche! Perfect spring food – I'm totally making this for brunch this weekend! I've grown to love spinach over the years.. This dish looks scrumptious. Two of my favorites: asparagus and spinach. Great celebration of the season. Two green veggies. One quiche. A force to be reckoned with. I love quiche because it's just so versatile and it makes for a great light meal. This sounds extremely good. Good for brunch,lunch… whenever!! Keep the late spring veggies coming!!! This looks delicious! more beautiful dishes every time I pop by! 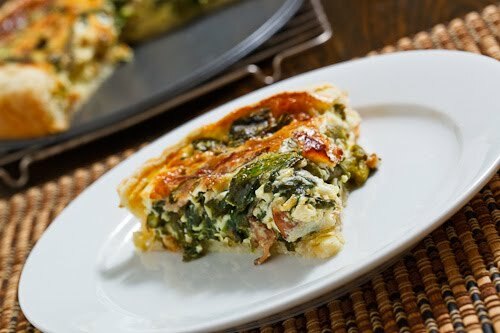 I love love love quiche and I think it's awesome that this one is absolutely packed with spinach and asparagus. Yum! I don't think there's ever a time I visit your blog and not want to eat my computer screen. Everything looks so tasty! Making this tonight – can't wait! Just noticed that it calls for a springform pan and I'm so excited because I HAVE ONE and I've only used it once…. Have you tried this with sausage instead of bacon? If so how were the results? Krista and Dustin: Sausage would be good!